Lucknawi Chikankaari has stood through decades and even today this beautiful and elegant hand-embroidery does not fail to impress. I dedicate this article to the artisans who have held the treasure forever. As a little girl when I wore my first Chikan salwar-kameej, I was totally fascinated by the colorful threads that wove bel (creepers) and butis (motifs) all over my white shirt. In a few years I grew up with an eye and taste for this delicate and artful work as my mother’s wardrobe spoke of her extreme fondness for the quintessential embroidery. Since I have gained her height, I have never given up on a chance to borrow some of her stuff. First she resists, then she gives but never forgets to warn me not to spill anything on the delicate whites and pinks. And before getting away I always tell her, Mumma, don’t you worry, I promise, I am gonna bring you some of the best and expensive works some day. Lucknow, the capital city of Uttar Pradesh, the one which is synonymous with the Nawabi culture has been the home of this cloth art for more than 200 years. This embroidery style has been patronized by the Mughals and no less the word itself was derived from the Persian word Chakin or Chikeen meaning a drapery wrought with needlework. Chikankari is a famous textile decoration style that had a major influence from the intricate carving patterns of Mughal architecture. Ever since the art was revived by Queen Noor Jehan, wife of Mughal Emperor Jehangir, it has lived through timeless elegance. Under the rulers of Awadh, Lucknow came to be recognized world-over for Chikankari. Let us know more about the glorious journey of white-on-white, quintessential embroidery, which has been a favorite of fashionable elites since decades. India has always been known as a land of artisans and craftsmen but Lucknow has sustained its global presence when it comes to providing finest quality of Chikan. The beautiful needle work has flourished and has created amazing embroidery designs on a variety of textile fabrics like cotton, muslin, silk, organza, net, chiffon, etc. It is to be believed that this special hand embroidery cannot be imitated in any part of the world. The legendary chikankari stitches have yet not been forgotten and thanks to artisan based clusters, today 250,000 artisans are associated with it. A few months ago when I was invited by India’s first and biggest Travel Writer’s Conclave through Uttar Pradesh Tourism, I got a chance to learn about Chikan more closely. In Lucknow, we were taken through the complete production process of a chikan garment at SEWA (Self Employed Women’s Association) Chikan. From the raw to the finished product, we learnt about the whole cycle that takes a few weeks. And most importantly, it was a beautiful sight to see the women create such lovely art-work on the cloth. They were adept at their work. There one realizes that discipline and a methodology go in tandem in making Chikankaari stand different. There are 30 stitches which are being used by the artisans even today and thousands of block patterns which have been there for years. 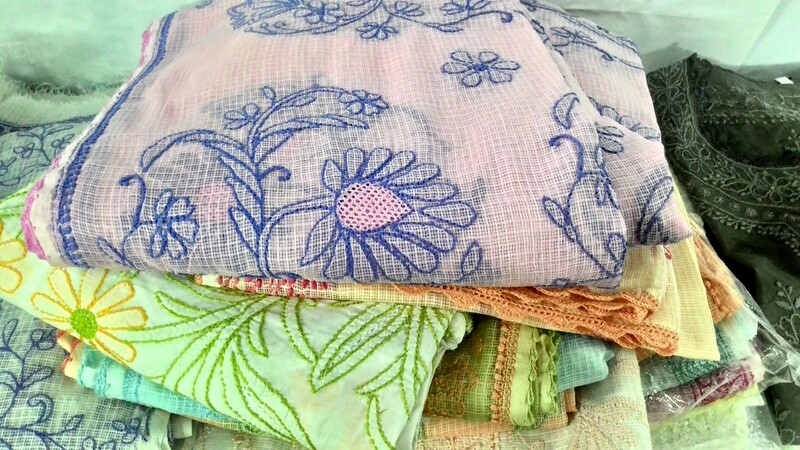 I picked some interesting names of stitches as well like Tepchi, Phanda, Turpai, Darzdari, Bakhiya, Jaali, Katao etc. Some of the stitches are similar to backstitch, hem-stitch or chain stitch. And it’s not about the names of the stitches but the movement of the needle that makes the ultimate difference. With the help of such groups, it is gladdening to see Chikankaari become a sustainable industry and profitable employment. And if you have been thinking why Chikan has never faded in its demand, it is because some of the leading fashion designers of our country have helped it trickle down to all types of clothes. From party wear to the most stylish dresses, chikankaari can be an added plus. Its beautiful, its royal, its gorgeous! Thus, if you have never worn a Chikan kurta, you must go for it right away. Nothing to beat the subtle charm and elegance of Lucknowi chikan. Nicely researched post. Lucky you got to see where these beautiful artworks are created. Brings back so many memories. I have so many chikan apparels and every time I wear them I always get compliments for the fine work. Hail Lucknow ! Nicely captured! Lucknow chikankari is unique indeed. 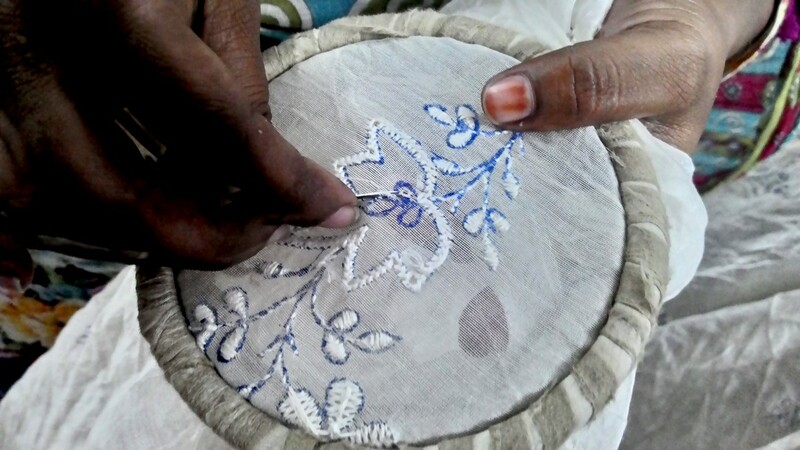 Nice post Manjulika – please explore the various stitches of Chikankari next time you go to Lucknow, would love to read about them. I love my chickankaari kurtas. Every time I visit Lucknow which is my nanihaal (grandparents’ home town) I purchase a chikan embroidered kurta! Lovely post, dear! Never been to Lucknow. And now I feel like going. The kind of dexterity required to come up with such elegant artwork is just phenomenal. Kudos to you as well 🙂 Well written!